The Large-format Duplex Scanner For Busy Workgroups. Now, your workgroup can take advantage of high-speed 2-sided document imaging, without breaking the bottom line. The fast, affordable WorkForce DS-60000 delivers remarkable scans from 2.7 x 4.7 Inches up to 11.7 x 100 Inches, quickly scanning 2-sided documents in just one pass. Use the 200-sheet Automatic Document Feeder (ADF) to scan stacks of 1- or 2-sided, large-size documents. Or, use the 11.7 x 17 Inches flatbed to scan drawings or maps, hard-bound books or other odd-sized items. The WorkForce DS-60000 blazes through each task at speeds up to 40 ppm/80 ipm. And, it consistently delivers vivid colors and crisp, sharp text thanks to 600 dpi, high-resolution scanning. It even makes it easy to dropout selected colors or choose a color and convert it to black. With this versatile performer, you get high-volume, precision, large-format document imaging. Plus, with productivity software included and the optional networking module, each member of your team can access high performance scanning for critical project needs. This product was purchased for a business that does quite a bit of 11x17 graphic work and needed a high-resolution scanner that could accommodate that size. Below is a summary of issues encountered with this scanner. The ADF on this document scanner works great. At a resolution of 300 dpi it scans multiple pages very rapidly (20 pages takes about 30 - 45 seconds) and gives good reproduction of the image. The ADF can also scan double-sided pages in one pass; however, the second side comes out slightly skewed. One drawback, when scanning through the ADF, it was neccessary to use the preview feature in the Epson Scan software to locate the image on the scanner. If this was not done, it would default to the upper left hand side and only part of the image would scan. However, this only has to be done once per job. Also, there may be a place where this can be set to automatically locate the image, but I was not able to find that setting. The OCR software also works relatively well. I scanned a 30-page document (Arial 10 font). Unfortunately there does not seem to be a feature that lets the OCR convert to rich text format. Instead the document has to be scanned to "searchable PDF" and then converted to "rich text" format via another program (Adobe Acrobat worked for me) so that it could be opened in a Word document (one of the reasons I am giving this only 3 stars). Most of the formatting (indenting, bold, fonts) translated. However, in several spots it did not catch all of the bolding and some of the paragraphs were run together. On one page, an entire sentence was missing. There were also several spelling errors on each page. It seemed to have the most trouble when the letters "r" and "n" were next to each other. It would interprete that combo as an "m". So proofreading of every page is a must. The Epson Scan Software that came with the machine works okay. Only wished they had put a button for the OCR feature on the first page to make the selection. Instead you have to first select "File Save Settings", then select "Options" under Image Format, then "Text" and finally check the box that says "create searchable PDF". That's a lot of steps if you need to regularly create searchable PDF files. Also, don't forget to uncheck that box after finishing your OCR scan or all future documents will be scanned as searchable PDFs. The file-naming feature is also less than ideal. There is no way to just save a scanned document under a chosen file name; instead the file prefix and save location has to be edited for each and every document. My old scanner let me just assign a file name and save location. Another reason for the 3-star rating is that right after purchasing the scanner, we noticed that when scanning large logos, it would randomly drop out part of the image. 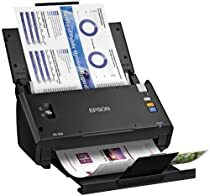 After a call to Epson customer service, they figured it was because of a hardware defect and offered to send a replacement unit. However, because over 30 days had passed, they indicated that the replacement unit would probably be a refurbished unit. When the second unit arrived, it had the same issue as the first unit. I again contacted customer service, and after a "high level" technician was consulted, the customer service rep suggested to go under "Configuration" and hit the "reset to factory defaults" button. Unbelievably, this resolved the issue. Just wished the first customer service rep had come up with that solution. I still do not know why both machines had this issue since the first machine was a new machine and no configuration adjustments had been made to it (at least not by me). In conclusion, if space requirements and price are an issue and 11x17 scan capability a must, this machine will do the job. Also, Epson customer service is responsive and will work to get issues resolved. 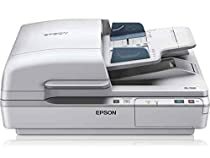 I found that if the documents you want to scan has holes punched in them at either the top or bottom of the document, they will NOT scan properly via the auto feeder. The punched holes somehow messes up the jam sensors, so the scanner has constant jams, which really aren't the paper jamming up, but rather when the punched hole portion of the document that is near either the top or bottom of the document goes over the sensors, it detects a jam. Even if the document manages to go all the way through the auto feeder, most of the time, it only scans about the top inch of the document and the remaining portion of the document is blank. I was able to prove that it is the punched holes that causes the jams and the incomplete scans, by simply taping over the open punch holes with scotch tape. Once I cover up the holes, the documents run through the auto feeder perfectly fine and scans the entire document just as it should. No more jams at all and no more problems with it only scanning the top inch of the document, instead of the entire document. Most of the documents I bought this scanner for, are 11" X 17" docs and they do have holes at the top of the document (on the 11" end of the doc), as they are in 3 hole binders. It is not feasible for me to tape over all the punched holes, then scan the docs, and then have to remove the tape... that would take me longer to do than it would to just place each sheet onto the flatbed one sheet at a time and scan it.... which defeats my purpose for getting an ADF scanner that would auto feed my 11" X 17" docs. So looks like this scanner is getting sent back. I've written Epson for a solution to this, but I'm not holding my breath waiting for that to happen. If you have any documents that don't have punch holes in them at the top or bottom of the doc (punch holes on the side of the doc feed and scan fine), then this scanner actually does a great job... it's just really hard for me to believe a major scanner manufacturer would make an auto feed scanner in which any docs with holes punched in them for binders will not feed and scan correctly! We bought this to replace a much larger scanner/printer and found it to be a good machine for scanning. Options are a bit limited but are still enough for our scanning needs. Would recommend this product.